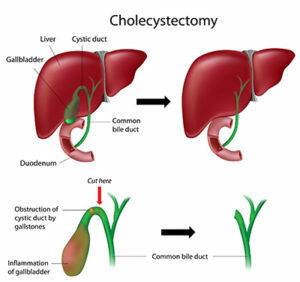 Cholecystectomy is surgical removal of the gall bladder. The gall bladder is an organ situated below the liver that works as a storehouse of bile (digestive juice from the liver). If the gall bladder function becomes deranged, it forms gallstones or gets infected. In these cases, it has to be removed from the body. Removal of the gall bladder is perfectly compatible with normal life, and does not cause any disturbance in normal body function. The surgery can be performed laparoscopically or robotically, making 3-4 small cuts on the abdomen. This is also done as a single port procedure for cosmetic reasons (especially in young unmarried women). Usually patients recover within a day and can be discharged the day after the surgery.